I used to find August generally depressing (not entirely, my wedding anniversary being on the 14th). When I was in school, there was always a sense of missed opportunity, that I had wasted all that lovely, free time. Later, added to that was anticipation of September stress from a combination of the holidays (preparing for and surviving) and the kids’ return to school (ditto). I no longer have to deal with K-12 institutions, but that August stress was replaced by ever-increasing work demands, which increased in the fall as quota deadlines loomed. At least, for the last several years, August has been sweetened by TCM’s Summer under the Stars, 31 24-hour marathons, each devoted to a specific actor. But I longed for a real summer. This year, I got it. I was able to rest, read, think, write, sit by the Brandywine and read a novel, hear the shofar at weekday morning services when Elul started, and, in general, be more aware of everything around me. In an early Twilight Zone episode, “A Stop at Willoughby,” an ad man escapes from a pressured, meaningless suburban existence to a town called Willoughby, July, about 1880, described as “a place where a man can live his life full measure.” That phrase matches how I feel about this first retirement summer. I am paying attention. I am starting to get things done: a new driveway, some landscaping, deck maintenance and staining, tree trimming, some actual progress in my genealogy activities. It’s a time of preparing for the fall, but there’s no dread associated with it, only a sense of getting ready. The Israelites, too, are getting ready (I bet you were wondering how I’d segue into the Torah discussion, weren’t you?) to start a new life in the Promised Land. They are not only told to bring the first fruits to the priest, not only to thank the Lord, but they are told word for word what to say (26:5-10, the “My father was a wandering Aramean…” passage). The recitation is a summary of the Exodus narrative, reminding the donor of the people’s history and that the Lord is the source of the bounty. A set speech similarly accompanies the donation of tithes to the Levite, the stranger, the fatherless, and the widow. These donations must be made mindfully. There is to be an antiphonal proclamation of curses by the Levites, with half the tribes on Mount Gerizim facing the other half on Mount Ebal, Levites in the valley between, the tribes responding “Amen” to each curse. Next, there’s a set of blessings that will result if the Israelites obey the law, which are general and obvious: fertility, wealth, the respect of other nations, etc. Then we read the Tochachah (warning), 54 verses of curses, starting with “But if you do not obey…” (28:15). [The minor Tochachah was Leviticus 26:3-46. This is the major one.] Today, the curses are read rapidly and quietly by the Torah reader. First, we learn who will be cursed, then, how, in graphic detail. It would be interesting to compare these curses with the description of the people under siege in the Book of Lamentations (maybe next year). They will be cursed in all ways, not only physical (ailments, infertility, destruction, exile, etc.) but emotional and mental, as in 28:65 –66: “The Lord will give you there (in exile) an anguished heart and eyes that pine and a despondent spirit. The life you face shall be precarious; you shall be in terror, night and day, with no assurance of survival.“ Moses despairs that, in spite of all they have witnessed and experienced, “Yet to this day the Lord has not given you a mind to understand or eyes to see or ears to hear.“ (29:3) But he assures them that, if they join with the Lord in this covenant, they will succeed. The haftarah, Isaiah 60:1-22, is the sixth of the seven haftarot of consolation. It is full of images of light and hope and an end to Israel’s mourning, very soothing for those recovering from the Torah reading. 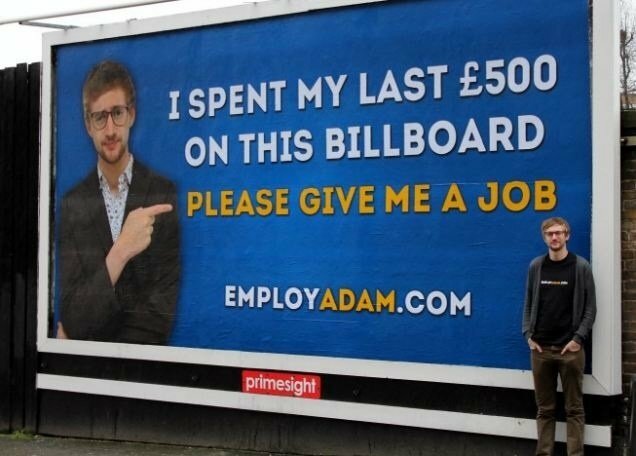 AN UNEMPLOYED graduate hoping for a career in media blew his last £500 erecting a billboard plea for a job. Adam Pacitti, 24, has yet to find work despite a first-class degree in media production from Winchester University. Published August 12, 2013, issue of August 16, 2013. I called the woman furtively, when no one else was home, certain that my husband, a psychoanalyst, would just dismiss the evil eye as an unconscious projection of one’s own evil. A woman with an Israeli accent picked up the phone: the ayin-hore lady herself. I introduced myself. “How does this work?” I asked, hinting at the price. “You can send me a check for $101,” she said. I reeled. That was a lot. It meant that I had bought into something, a whole ideology. I hesitated. “Well,” I thought. “If that was the going rate for spirits to leave, nowadays….” I took down her address. Before she started her procedure — blay gisn, it’s called in Yiddish — she asked for my Hebrew name and my mother’s name. There was a sound of pots and pans clattering. I asked what she was doing. “Heating lead on the stove,” she explained. I heard men’s voices in the background, people coming in and out, doors slamming, men who had arrived in time for supper. The ayin-hore lady made casual conversation with her visitors and with me. More pan movements. “What now?” I said. “I’m pouring the melted lead into another pan with cold water,” she replied; then she went quiet. I got the feeling she was praying. Or maybe she was really making supper? In my gut I felt terror. Then I rolled my eyes. Come on, an evil eye remover is predisposed to see those little buggers everywhere. She responded: “The bubbles in the lead. They’re like eyes.” She stirred some more. “Huge,” she exclaimed. I nodded — sure, sure. She probably said that to all her customers. “I’m doing it all over again, until the eyes disappear,” she let me know. Maybe she should use Shout, I thought. “They won’t disappear so fast,” she said in a worried voice. 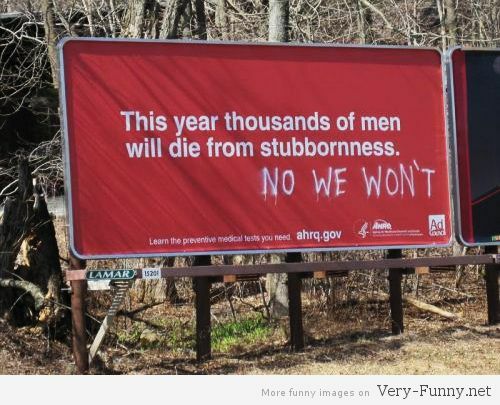 Good, I thought grimly. Stomp them all. 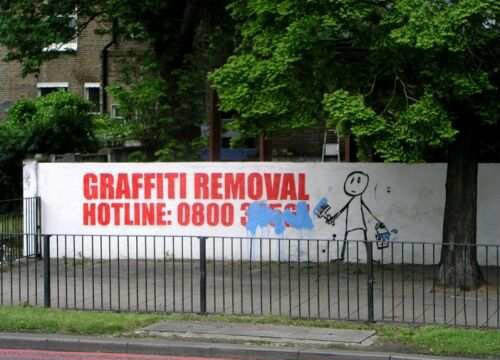 Obliterate every last one. Kill the little buggers. We shmoozed some more, the ayin-hore lady and I, as the world continued to stream through her kitchen. Then she gave me a heartfelt blessing, and we said goodbye. After I got off the phone, I felt elated, relieved. I wanted to call my mother to tell her everything. The next day I wrote the check, but couldn’t find an envelope. The following week, more excuses kept cropping up. At some point it hit me that I didn’t want to pay her. Paying made the episode too real. Ruchama King Feuerman’s new novel, “In the Courtyard of the Kabbalist” (New York Review of Books), will be published this September, and can be pre-ordered online. Copyright © 2013, Forward Association, Inc. All Rights Reserved. This entry was posted in Uncategorized and tagged billboard, blessings, curses, Deuteronomy, first fruits, Ki tavo, Tochachah, wandering Aramean. Bookmark the permalink.